It’s been a fun trip so far. Yesterday I took a different route here through the town of Protivin and had a lousy day fishing… After a couple of hours, there was only one fish caught – it wasn’t even worth keeping. A visit to another stream didn’t yield much success either. But things changed today and it’s been an enjoyable excursion. I’ll try to keep the chatter down and post a lot of pictures… and one video. I hope you enjoy riding along as much as my kitty, Serena. 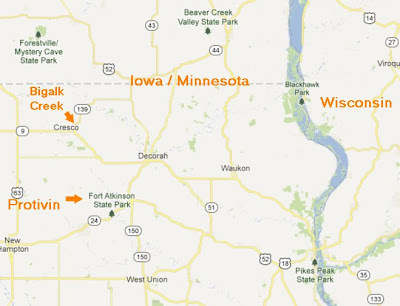 Yesterday we visited both the Bohemian Creek at Protivin as well as Bigalk Creek northeast of Cresco (just a stone’s throw from Minnesota. Bomemian Creek didn’t pan out. It’s a very small trout stream – three tenths of a mile long. But the good part is that I can likely camp there for free in the little parking area. 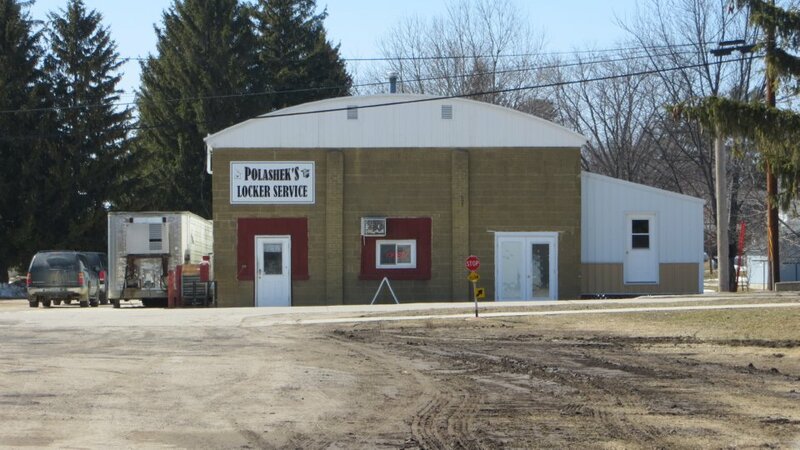 One of the highlights was a trip to Polashek’s Meat Locker in Protivin. I bought some Jaternice (a Czech sausage featured on another blog post). It is thawing at the moment. Also purchased were some beef sticks (small snacking sausages) with jalapenos and pepper jack cheese. Yummmmy! 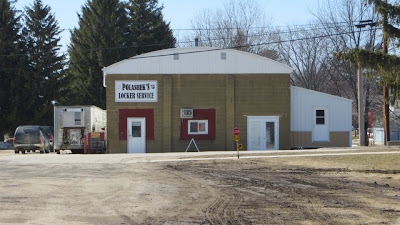 Polashek’s Meat Locker – a great place to visit for fresh, high quality meats. After leaving Polashek’s, I headed into nearby Cresco where I stopped at a local tavern for a Blue Moon. 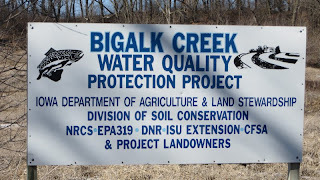 One of the locals directed me to Bigalk, another nearby stream, in hopes of finding some fish. Granted, the courthouse was across the street from the bar but a Blue Moon beer sounded good. I assumed (correctly) that there would be middle aged beer drinkers at the bar. The directions were perfect. In the boonies, Bigalk was a perfect place to camp for the night. Bigalk (prounounced BEE-yahlk) is a typical small trout stream with lots of holes and the potential for good fishing. Unfortunately, I don’t think many trout were stocked. I fished for an hour with no luck at all. By this time it was getting late so I put Serena in her tent while I readied the van for overnight camping. After a good night’s sleep, this morning I headed into Decorah. 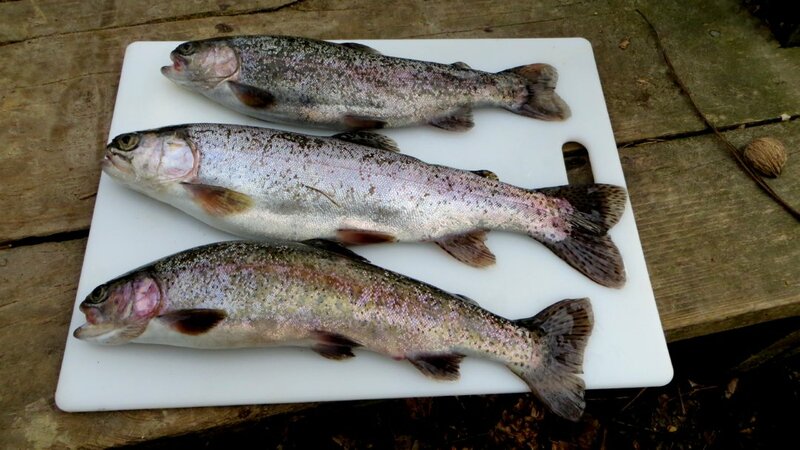 A quick call to the recorded trout stocking information helped confirm the plans for the day. Even though Trout Run Park was stocked two days earlier, I headed there with high hopes. Excited like a ten year old, I caught the first fish on the very first cast. The other four came quickly after that. Here are the three nicest fish. That one in the middle looks grim… She should! Tonight’s dinner is fried trout with fried potatoes. Below is a shot of Trout Run Park by where I was fishing this morning. This is on the south side of town – there is very little snow left. But the north side of town is a different story. 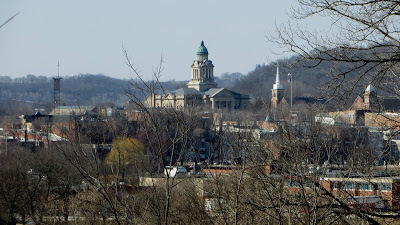 The city of Decorah is built in a massive meteor crater. (Decorah was recently in the news when this fact was discovered) The north side is sheltered from the sun. It’s like a different world. 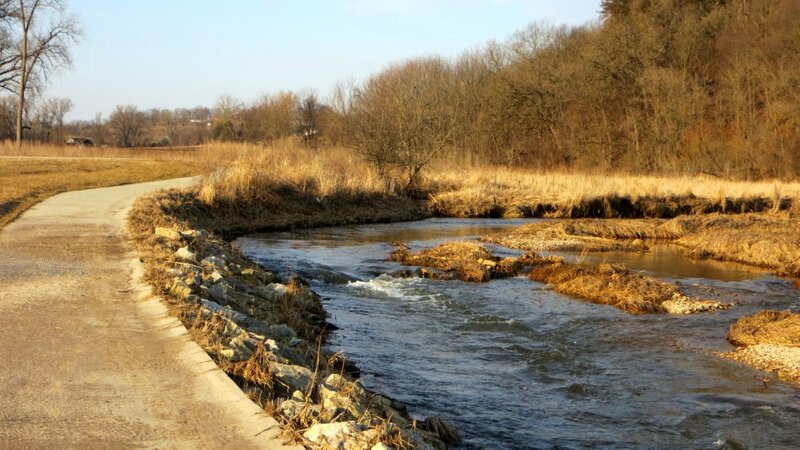 Below is Twin Springs trout stream in Decorah… It’s just a few miles from Trout Run! Isn’t it amazing how different the two parks are? The water in this shallow stream is high right now and was making a loud babbling sound. I recorded five minutes of video at this location. After extracting the audio, I plan to save it as an MP3 and loop it through the Sangean radio in the van. Won’t that make a soothing sound to listen to while trying to sleep? I cleaned the five fish from Trout Run here. As you can see, there is no climbing around to reach the shallow but very swift stream. It’s just a foot or two from the cutting board to the strong current. 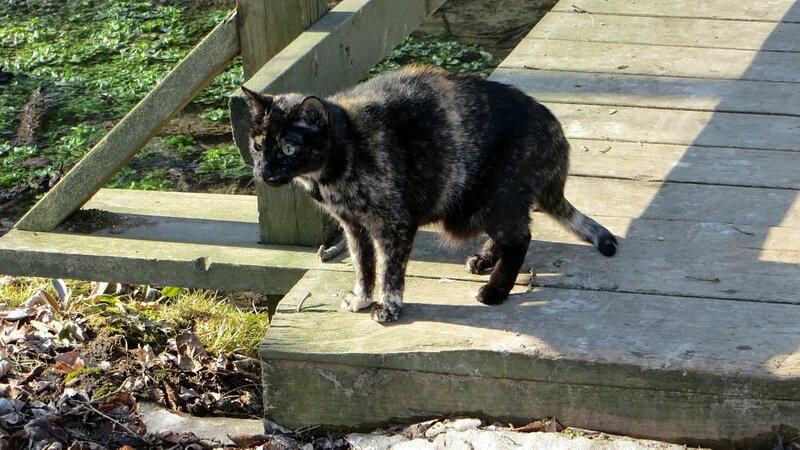 Serena loved Twin Springs and played on the bridge, explored the snow and also chewed on the green grass. She was intrigued by the swift stream but at the same time clung to her Daddy’s safe arms while near the water. Just a few yards from the snow the green grass was making an appearance. 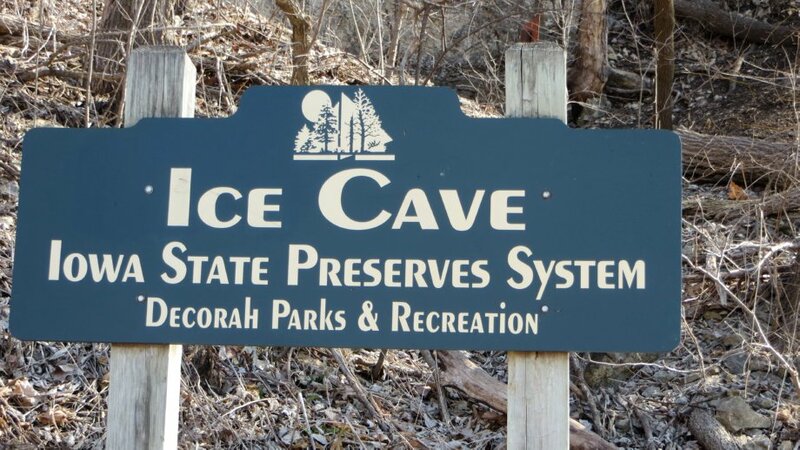 The next stop was the Decorah ice cave. One thinks of an ice cave as a hole in the ground with ice and only one opening. This is not the case. I learned some interesting things in the process. This cave is shaped a little like a human stomach – open at both the top and bottom ends. Warm air from the cave escapes through the top opening. 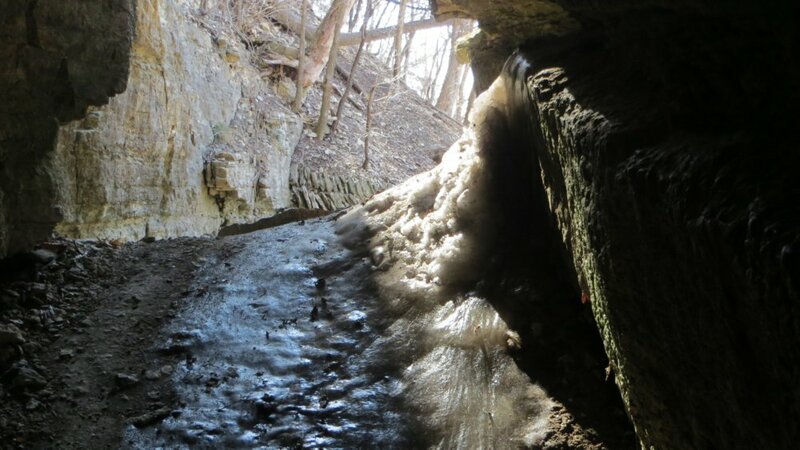 Very cold air – air that is below the temperature needed to freeze water – enters the lower part of the cave during the winter and chills the rocks at the bottom. As the seasons change, the melting snow runoff runs through the top opening and pours into the “ice chamber” in the belly of the cave where it freezes. The ice lasts until August or September! I crawled down into the top of the ice chamber area. It is very dark and extremely slippery. It was difficult to get back out with that much ice and the incline. 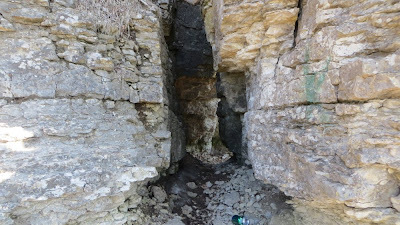 Thankfully there is a fair amount of cushioning because I fell on the backside a number of times while descending into the cave. Entrance to the ice cave. At the time I’m posting this, I haven’t decided where to camp for the night. 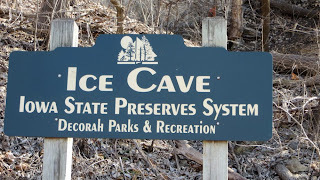 There is a city operated campground near the ice cave. It sounds kind of tempting to throw some Diet Cokes into the cave and retrieve them in the morning. We’ll have to see how things pan out. At any rate, a return visit to Trout Run is planned for the morning and I’m hoping to gather another five trout. My sister is now in town and watching over Dad. That gives me a much needed rest. 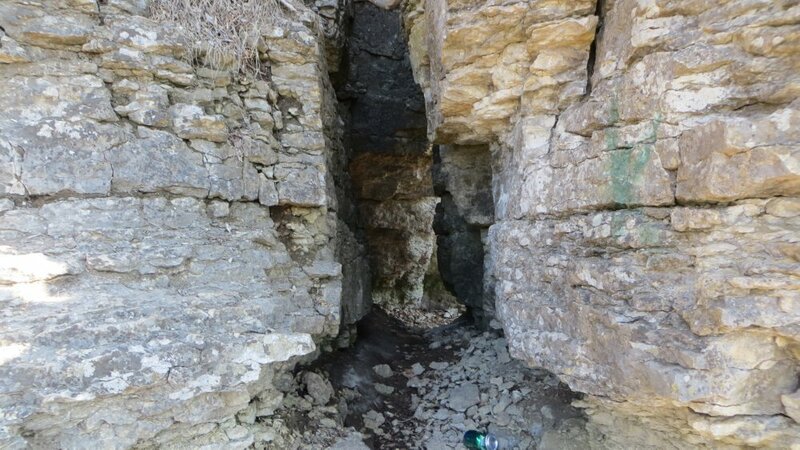 It sure is nice to get away for a little trout fishing fun and now some spelunking even though I can only go a few yards because the tiny cave is not meant for “plus sized” people! Thanks for visiting and riding along. 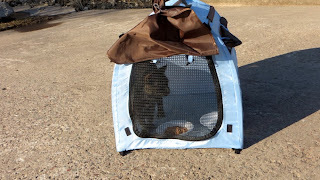 Tomorrow Serena and I will be heading back toward Elkader and will camp at a free spot near the trout hatchery. 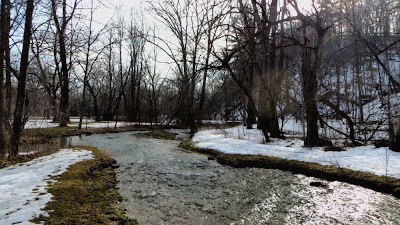 In the meantime, here is 11 seconds of the babbling trout stream for your relaxation! The ice cave is amazing. The scenery gorgeous. And the fish… just wonderful! I forgot all about you, I should have stopped by for a visit with you on my trip to Leeper Pa where I got my new trailer. LOL. I hear you about the ammo thing. There are plenty of fish around here. I brought back 7 (possession limit is 10) and I ate/gave them all away. We’ll probably bump into one another some time. How long was that trip? That’s some awesomely delicious looking fish! You are living the good life up there! 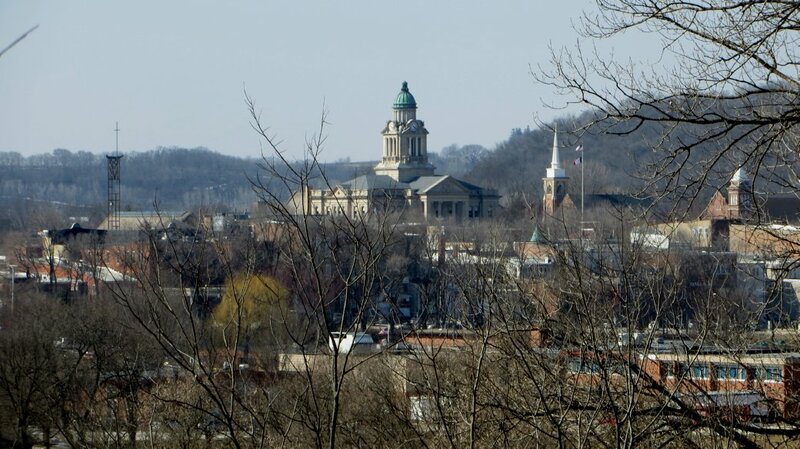 Decorah is one of those places I want to visit… mostly primarily for the eagle nest I always see online whenever they hatch their young. 🙂 Anyway, happy to read your post! You inspire me to get another van!